With no deal reached between Greece and its creditors despite months of negotiations over the release of further financial assistance, the country opted to delay a €300 million debt repayment to the International Monetary Fund (IMF) that was due on 5 June. The Greek government now intends to bundle together several payments totalling €1.6 billion into a single payment due on 30 June, while fresh proposals have been communicated to creditors in an attempt to secure additional bailout funding. This impasse could have been avoided. The IMF, an institution that for decades has loaned money to countries in distress, successfully sidestepped Greece-like drama in the past. The IMF accomplished this by relaxing the reforms required of borrowers in the run up to elections. In a recent study, I and my co-author Teri Caraway, find the IMF softened mandated labour market reforms in loans negotiated within six months of a pending election. The further away elections were, the more stringent the reforms required in exchange for financing. The IMF typically softens required reforms prior to elections to avoid precisely the situation now playing out in Greece. Tough reforms give opposition parties ammunition to use against the government and increase the chances that the incumbent parties will lose. In Greece, the painful austerity policies demanded by international lenders resulted in a series of convulsive protests that shook the nation and ultimately led to the election of a new anti-austerity government under Syriza in place of the previous New Democracy-led government fronted by Antonis Samaras. Newly elected governments feel little obligation to abide by the terms of an existing loan agreement. Following the 1987 elections in Argentina, for example, the new Peronist-dominated Congress tried to undermine the government’s reforms, especially those at the heart of the IMF loan programme. 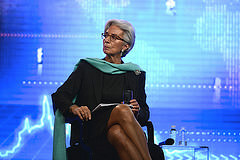 The resulting policy paralysis contributed to the collapse of the IMF programme. In Greece, the newly elected government led by Syriza’s Alexis Tsipras sought to re-negotiate the terms of their loan programme. If the ‘Troika’ of the European Commission, the European Central Bank and the IMF had dialled back the required reforms prior to the 2015 Greek election, things might be very different today. Syriza may not have won office and the ensuing stalemate that has crippled the country may have been avoided. Yet, few attempts were made to soften the requisite reforms prior to the 2015 election. We can only speculate as to why. One possibility is that the IMF suggested toning down the reforms but was overruled by the European Commission and the European Central Bank. In our study, all of the loans we examined were made by the IMF alone – unaccompanied by other institutions, like the European Central Bank or European Commission. Perhaps the dynamics of the Troika have led to different lending practices. Of course, we do not know what went on behind closed doors so we can only speculate about the internal dynamics of the Troika. The IMF has a history of lending to countries in crisis and as the “lender of last resort” for decades the Fund has presumably discovered expedient negotiating and lending strategies. The European Commission and European Central Bank would be wise to take note, particularly of the importance of democratic elections, which influence not only national politics but also the international economy. This post first appeared on the EUROPP blog. Stephanie J. Rickard is an Associate Professor of Political Science at the London School of Economics in the Department of Government. The Greek Government’s programme: an act of defiance or a call for compromise? This entry was posted in Euro, Greece and tagged conditions, Creditors, elections, Greek elections, IMF. Bookmark the permalink. Politics plays a large role in it… Especially Merkel in Germany plays the ‘tough guy’, because if she doesn’t she’ll likely lose leadership of the CDU/CSU. Also she wants to ‘prove’ at the expense of the Greeks that left-wing politics don’t work, thus trying to flank out die Grune, Die Linke and other left-wing parties. And since a lot of European government face resistance in their own countries from both anti-EU parties and left wing parties (who are highly opposed to the often harsh austerity measures the most of those, often right-wing, governments have introduced), she gets supports from others. However, by keeping insistent on (far) right-wing austerity measures, the European Union is running both Greece and itself into the ground. Instead of relaxing the austerity measures, the EU has even increased the weight of the ‘required’ austerity measures, completely ignoring any common sense.. and ruining Greece in the process. SYRIZA can’t agree with the proposed austerity measures since it punishes the common people for errors mostly by big companies and millionaires. And while the common people aren’t completely free of blame, they are taking the blame and hit for those who are the majority of the cause Greece does need help….